I am a lightweight backpacker with a typical weekend pack weight of 15 lb (7 kg) and a multi-day weight of 20 lb (9 kg), which includes food and water. 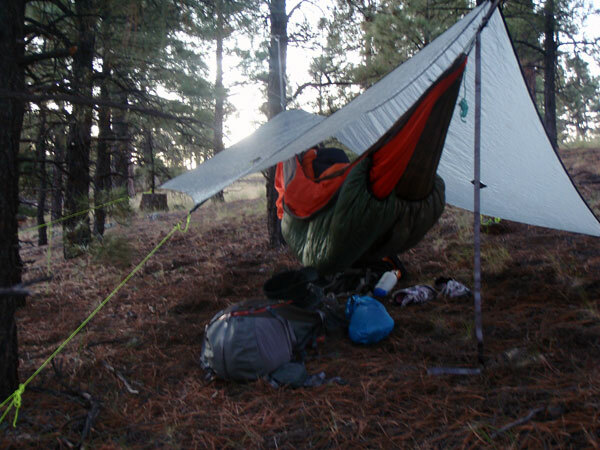 I prefer lightweight trail-running shoes and backpacking with a hammock as part of my sleep system. Lifetime warranty against defects in workmanship and materials. KAMMOK also offers a 100% satisfaction guarantee and a "cradle to grave" policy so products can be recycled once they reach the end of their lifecycle. 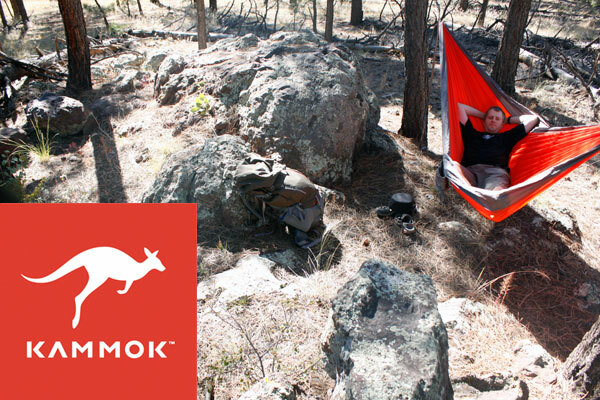 The KAMMOK Roo is a large, gathered-end hammock constructed out of three pieces of LunarWeave(tm) fabric. Each seam is triple-stitched with a flat construction. The ends of the hammock have a sewn channel where a small loop of spectra cord is threaded to gather the ends to create an attachment point. The cord loops are secured with a Double-Fisherman knot and loop through the hammock with a Lark's Head knot. Attached to the spectra loop is a small wire-gate carabiner secured with a twisted Lark's Head knot. I would describe the "Roo Red" as a slightly orange color that is very brilliant. 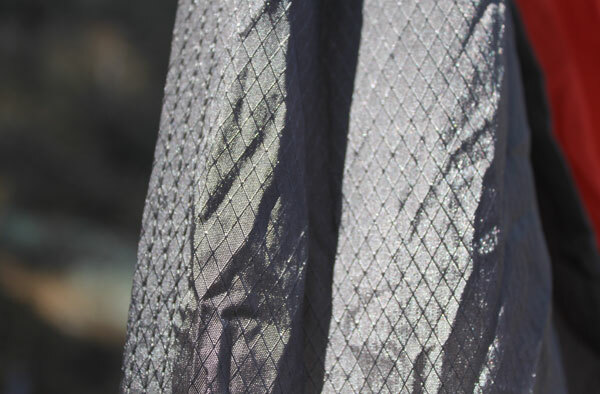 And the diamond ripstop has a unique sheen that makes the fabric glisten in the right light. The fabric itself is very smooth and supple. I love how this fabric feels against my skin. The fabric has a very slight stretch when I tug against the edges. The Roo comes with two small loops of rope to gather each end, and attached to each rope loop is a small metal wire-gate carabiner. To attach the hammock to the trees during my hikes and backpacking trips, I used webbing straps to create anchor points for the hammock. 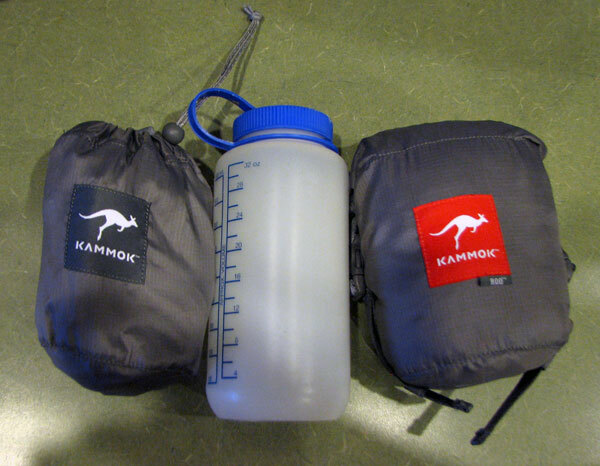 The Roo (on the right) compared to a 1L Nalgene bottle. The stuff sack has an inner membrane, made with the LunarWeave fabric, and has a drawstring closure with a cord lock. The outer membrane has a roll-top and is secured with two plastic buckles. The outer fabric membrane is water repellant, a 100% nylon, 70-denier ripstop shell with a DWR finish. The stuff sack is large enough for the hammock, rope loops, and carabiners to fit securely. The outer roll-top membrane can compress the stuff sack package into the size of a small cantaloupe. The roll-top has a 0.75 in (2 cm) wide stiffener on one edge that makes rolling an even edge easier. This outer membrane is 5 in (13 cm) long. The entire stuff sack, unrolled, is 10.5 in (27 cm) long and 7.5 in (19 cm) wide when laying flat. The stitching and construction of the Roo are all excellent. I can tell a lot of care and attention to detail went into the hammock's manufacturing and quality assurance. I have taken the Roo on three day hikes, one soccer practice, and two backpacking trips, including a three-day trip into the Upper Pumphouse Wash in Northern Arizona where temperatures got down to 15°F (-10°C) with scattered snow conditions. I have also used the Roo in dozens of "hangs" indoors with my family. 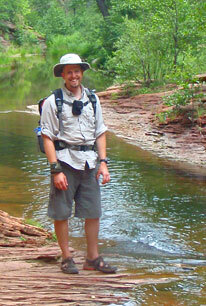 My other backpacking trip was also in the Coconino National Forest. On this trip the weather was stormy and I was caught in a sudden thunderstorm with rain and lightning. The temperature was in the mid 30s°F (around 0°C). One of my first reactions to the Roo was the stuff sack. I don't think I've ever seen a more complex stuff sack for a hammock before. The outer sack has a roll-top closure with two buckles that can cinch down and compress the entire package. Once opened, I noticed a secondary drawstring closure half-way inside the roll-top sack. The complex sack made me think that with a few modifications, this would make a great summit pack. As it is, the stuff sack took some getting used to. The inner drawstring membrane is almost overkill. 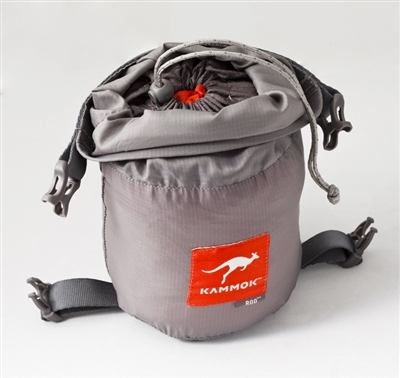 To pack, I would pull the upper roll-top portion down around the outside so the drawstring opening was easy to access; then I would stuff the Roo, cinch up the drawstring, and pull the outer membrane over and then roll it down to complete the packing. It takes me more time to stuff the Roo because of the extra steps involved with the stuff sack. As a simple, gathered-end hammock, the Roo sets up very quickly and easily. And with its small pack size, I felt comfortable taking it along a few day hikes without worrying about bulk in my pack. When set up, the Roo is BIG. 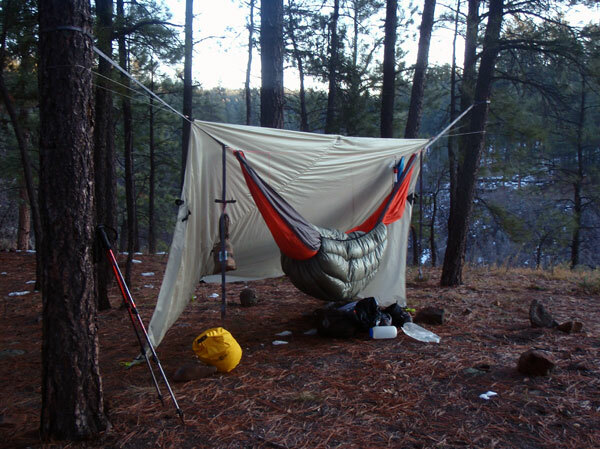 In fact, it is the largest hammock I've ever taken camping, hiking, and backpacking. Most people agree that larger hammocks are more comfortable because you can achieve a flatter, more ergonomic lay by sleeping at a more exaggerated diagonal position. 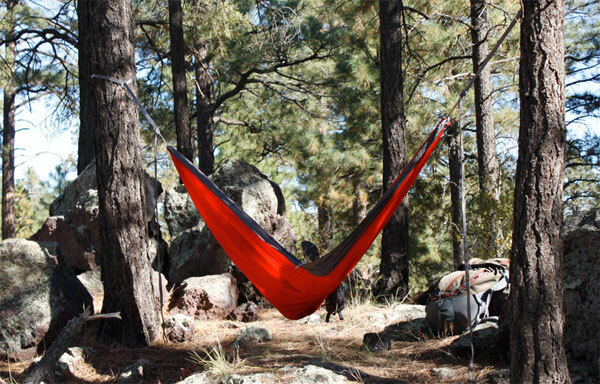 Typically, a camping hammock is hung so the suspension lines are at a thirty degree angle to the ground. This not only reduces the load strain on the anchor points, but it also enables a nice sag in the hammock. With the Roo, I found that I needed a much deeper sag. This is common with large hammocks, since a shallow sag and a tighter hang creates a "bathtub" or "canoe" effect that can cause shoulder squeeze and make it difficult to get a good diagonal lay. In addition, with a more acute diagonal lay, less of the width of the hammock is used to sleep on so there are wide strips of "extra" fabric flapping over my face and feet. To eliminate this extra, unused fabric, I needed to hang the Roo with a deep sag. Making this change made the Roo very, very comfortable. I found the deep sag and soft fabric a great combination and a great hammock to sleep in. This photo shows the Roo with a nice, deep sag with an almost perpendicular sleeping angle and near-flat lay. However, with such a deep sag, this means the distance from the bottom of the hammock to the two gathered ends is very high. 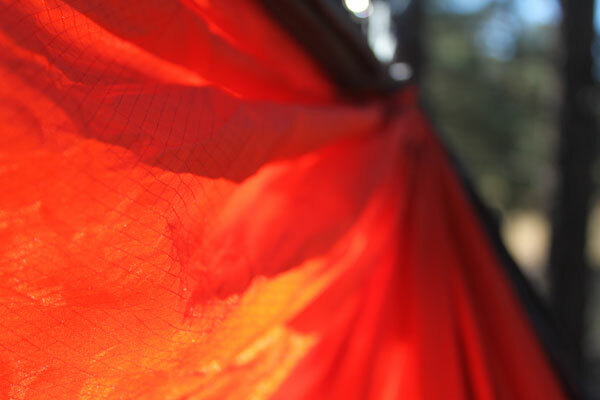 In the field, this means I need a much wider tarp to cover the hammock. When I went backpacking, I found that in order to get the most coverage, I couldn't hang the Roo at its optimal sag that I tested at home. I don't have a tarp big enough to cover the Roo adequately. This was a problem during the thunderstorm I experienced because the hammock extended to the edges of the tarp's ridgeline. The hammock was still comfortable with the shallow sag, but I had to deal with the flapping fabric over my face and feet. This was very annoying, especially during my trip in November when the temperatures were so cold that condensation was collecting on the Roo fabric. The Roo is heavier than other gathered-end hammocks I typically use, and with its size, I need a larger tarp to adequately cover it. However, the soft fabric is a delight. At home, this is my family's favorite hammock. My boy's often fight over who gets to sleep in the "kangaroo" hammock in their bedroom. PRO—Excellent craftsmanship and construction; soft, comfortable fabric; small pack size; Large, comfortable lay. CON—I need a bigger tarp to cover this hammock.